PRAN SHREE, grew up in a family business and has been involved in it since the age of 14. 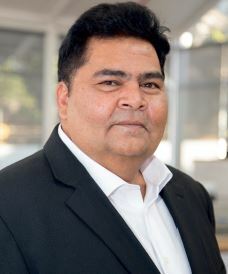 Shree said that he had sought much inspiration for his career from his father, Shree and his mother, Savathree who were entrepreneurial by nature. He continued, "My personal drive was fuelled by the need for job creation and observing the impact it had on a single employee being able to feed a household. "My wife Annisha and I grew our retail butcher into a wholesale meat business, then we increased our cold storage business into a large storage facility for citrus for six months in a year. During our off-season period, with the unemployed staff component of 250 people, and being supported avidly by Annisha, together we founded our business Shree Property Holdings," said Shree. He further commented, "Working in a family business has added to our success as we all focus on our strengths and it enhances the business. Since we are a family run business, this ethos spills over into our company culture, and as a result our staff members are also treated as family and team players. I was exposed to a highly autocratic leadership style and implemented this in my own business but once the younger generation joined the business, I saw how beneficial a democratic leadership style was." In recent years, Shree Property Holdings has notched up much success. The company operated the largest solely owned cold storage facility comprising 23 000 pallet positions from 2002-2012 in the southern hemisphere. In addition, Pran Park at Dube TradePort has been established. This facility has a total land area of 150 000 square metres, comprising six state of the art manufacturing facilities that produce goods ranging from electronics to health devices. Shree said, "The company named the Park after me because my name means life, and they felt that I would bring life and momentum to the north coast. I see this as a sizeable achievement personally because the majority of property investors had their reservations about the Dube TradePort, but I envisioned it to be a success." In 2016, Pran Park was completed and tenanted, securing more than R1,3 billion in Foreign Direct Investment and creating more than 2 000 long-term employment opportunities in the area north of Durban. "I think it's imperative that we become a business and investor friendly country. It is important to enable business to fast track applications and permits in order to enhance growth and development with specific reference to the construction industry. The future of success lies in the hands of Public Private Partnerships (PPP), and these government institutions along with private investors attaining the single goal of society enhancement and economic growth. I foresee KZN becoming a larger contributor to the South African GDP and this increase in momentum will be highly valuable for business owners in this province," concluded Shree. After moving the company's focus into the commercial and residential markets, Pran Boulevard is the first commercial building to be built. Pran Boulevard will bring a new light to the Ridgeside Precinct as well as introduce a new standard of Premium Grade office space. Pran Boulevard will be the new head office for Shree Property Holdings and the new home for KPMG Durban, as the anchor tenant. Woodmead in Shakaskraal and Pran Park - Shakaskraal are two new projects taken on by Shree Property Holdings as a large mixed development of residential, commercial and industrial, spanning over 400 hectares. The residential development of 4 000 homes will be aimed at middle-income earners complemented by a commercial development. Pran Park - Shakaskraal is being developed to house manufacturing facilities that will create jobs for the KwaDukuza area. Shree said, "The impact created by business sustainability is for us not only to manage our triple bottom line, but to implement a green initiative strategy through our product offering, that shall ensure the longevity of our business. The opportunity arose for us to invest more initial capital into our buildings making them green rated and equipped with solar panel systems and water conservation systems etc. This is massively demanded by blue chip clients looking to achieve their own business sustainability." When not working, Shree enjoys cycling and jet skiing. He concluded, "I also enjoy spending quality time with my wife and children outside of the business. My wife is my best friend and confidant. As a family we enjoy travelling together and of course, my most expensive hobby is my love for sports cars."